The battle between OnePlus and Flipkart is already out on the field now. 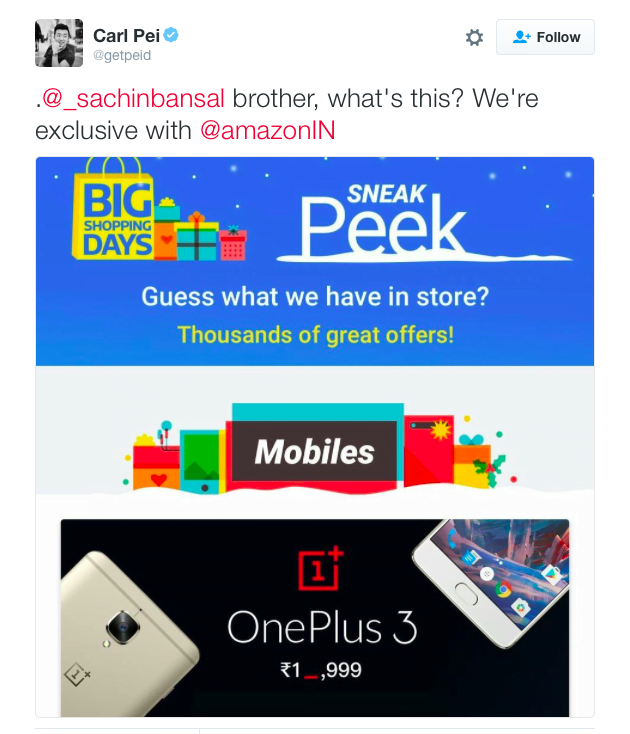 Both the companies are locking horns over the “exclusivity” factor that the OnePlus 3 comes with, which states that its only official selling partner in India is Amazon.in. It all started when the OnePlus 3 sale banner went live on Flipkart, which showed the device to be sold for as low as Rs. 18,999 as a part of Flipkart’s upcoming Big Shopping Days sale. Regardless of Flipkart’s bold advertising for the upcoming sale, OnePlus has made it sufficiently clear that it cannot guarantee the “authenticity” of the OnePlus 3 units that will be sold on Flipkart. Despite the slam, Flipkart did not backtrack the advertisement, which means that it will be selling the OnePlus 3 as a part of its sale carnival. It would be interesting to see if Flipkart stays adamant on its decision and eventually kicks off the sale of OnePlus 3. If the sale happens, then it will no doubt be a fantastic offer for the buyers, but Flipkart has already mentioned that the deal will have limited units of OnePlus 3 64GB Soft Gold variant. Also Read: Dash Charge vs Quick Charge: Which one’s better? However, we do have our share of concern for how OnePlus would treat the OnePlus 3 units that will be sold on Flipkart. The company has not made it clear if it will bar the warranty of the units sold through Flipkart or there will be any other action taken to kerb the buyers from buying the product on Flipkart. A lot of drama awaits us in the coming days on how Flipkart and OnePlus sort out the matter (or not). Stay tuned with us for more news on the issue. Off Topic : After Android 6.0 update for Redmi Note 3, second sim is also working as 3G. So one sim can work as 4G/3G and other as 3G. Whats the use? You can’t use data in 2nd SIM when Data SIM is 1st…! Amazon is any day better than Fk and SD . Be it in terms of quality of product or quality of customers services.Amz just rocks.